Tim graduated from the University of Miami, FL in 2006 earning a Doctorate in Physical Therapy. Tim joined Bay State as a managing partner in 2011 opening its office in South Boston. Tim’s professional interests included advanced treatment of post-surgical shoulder and knee patients, management of running related injuries, and manual therapy of the spine. Tim uses a hand’s on approach to assess deficits during a thorough evaluation, than implements an individualized plan of care for a personalized treatment plan. 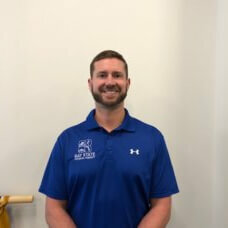 Tim is also a certified Strength and Conditioning Specialist and works on developing treatment plans for patients post injury so that they can continue to improve their overall health and fitness. Tim is married with 2 children and resides in Hopkinton. Along with spending time with his family, Tim enjoys playing basketball, volleyball, running in local 5k races, half marathons and marathons (finished Boston marathon 2015, 2017) and following Boston sports. He also enjoys being active in the community and has spent time as a coach at the high school and middle school level.